The ALLOY APS-24T6SFP is a Layer 2+ 802.3at POE Gigabit Ethernet switch. 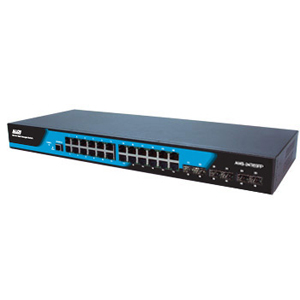 With 20x 10/100/1000Base-T RJ-45 copper ports, 4x GbE Copper/(100M/1000M) SFP ports and 2x 100M/1000M SFP ports and a Switching Capacity of 38Gbps, this high performance switch is ideal for server aggregation applications, as a departmental switch, or to support Gigabit Ethernet to the desktop for power users. With the added flexibility of supporting both 100Mbps and 1000Mbps SFP Modules this switch can be integrated quickly and easily into your existing networking infrastructure. The SFP slots on the switch support all types of Fast Ethernet or Gigabit SFP modules – 100Base-TX or 1000Base-T copper UTP as well as multimode, singlemode and WDM network connectivity over fibre optic cable – enabling copper or fibre uplinks.